For 35 years, neither rain nor snow nor dark of night, or even occasional March heat, has stopped the Baker to Vegas Challenge Cup Relay. Not even major construction on Highway 160 can stop it. 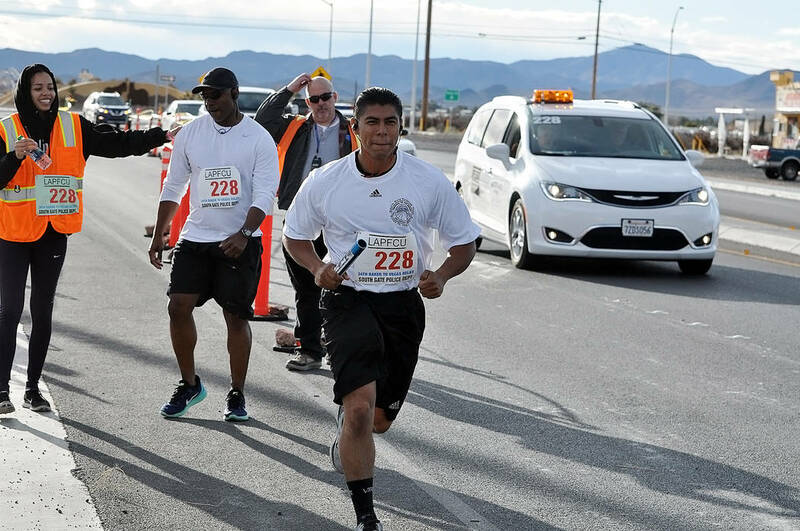 Horace Langford Jr./Pahrump Valley Times Runners from the Riverside, California, Sheriff's Department and the U.S. Attorneys Office were the first to reach the checkpoint at Highway 372 and Blagg Road during last year's Baker to Vegas Challenge Cup Relay. 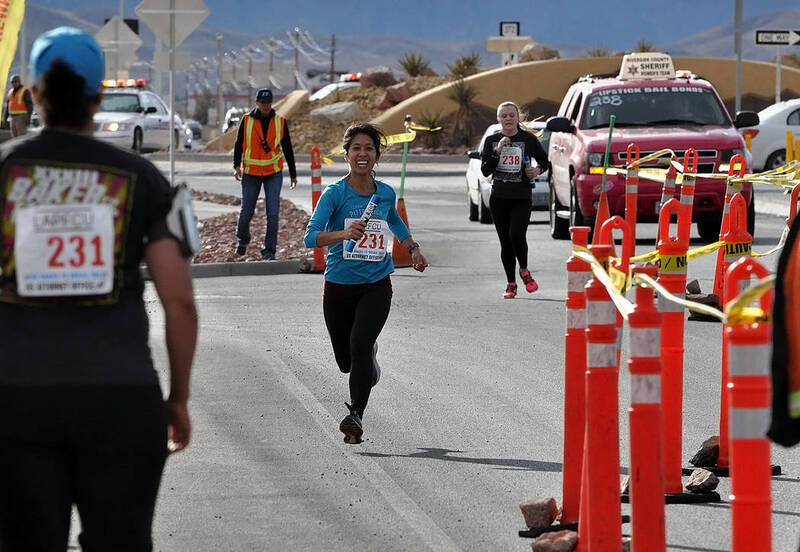 Horace Langford Jr./Pahrump Valley Times The South Gate, California, Police Department team transfers the baton at a checkpoint in Pahrump during last year's Baker to Vegas Challenge Cup Relay. 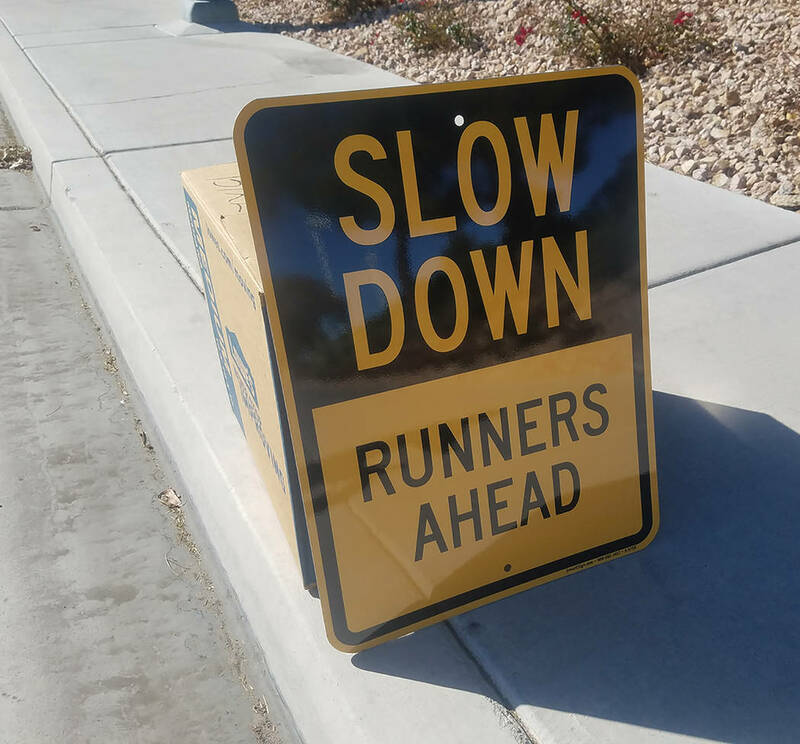 David Jacobs/Pahrump Valley Times Motorists driving Saturday in Pahrump will have to be wary of the Baker to Vegas Challenge Cup Relay, which will send runners along Highways 372 and 160 in Pahrump on their way to Las Vegas. But it can cause one major change. As of Monday, 285 teams of law enforcement professionals were entered in the race. Once again, a team from Queensland, Australia, will be making the longest trip to participate, according to Ruben Gonzalez, the race director. “You’ll know where the Aussies are, because they’re the loudest,” Gonzalez said. Gonzalez, a detective in “real” life, is on the board of directors of the Los Angeles Police Revolver and Athletic Club, which serves every Los Angeles Police Department officer, sworn or retired. That is how he wound up with the task of overseeing the race, although he readily admits that Foote’s acumen and experience don’t leave him with much to do. “I’m not sure exactly what my job is,” he joked. “I’m basically assisting Chuck to make sure he gets everything he needs from the club. Gonzalez noted that Foote’s relationships developed over the years come in handy, including one with Aggregate Industries, which is rebuilding lanes on Highway 160. “We’re going to run on the part that they’re working on,” Foote said. That stretch includes Leg 15, the longest of the race, which starts at Tecopa Road and covers 10.7 miles, gradually steepening over the final 8 miles. Gonzalez said more than 1,000 volunteers help make the race happen, but none of it would have happened without Foote. Fittingly, Foote will wrap up his tenure by crossing the finish line. The LAPRAAC already knows who will move into Foote’s role next year, and he is already involved in the operation. One thing will remain the same, and that’s what compels people from all over to gather in the desert to run a leg of a 120-mile relay race. The race will start at 8 a.m. Saturday, with the first runner expected to reach Stage 12 at Highway 372 and Blagg Road at roughly 6 p.m. The last runner is expected to leave Stage 13, 4 miles east of Pahrump on Highway 160, at roughly 1:35 a.m. Sunday. The Los Angeles Police Revolver and Athletic Club will hold its 35th annual Challenge Cup Baker to Vegas Relay from 8 a.m. Saturday until 9 a.m. Sunday. The race will start along California Highway 127, 25 miles north of Baker, Calif., and go north to Shoshone before proceeding east on California Highway 178 to the Nevada state line. The race continues in Nevada along Nevada Highway 372 to Highway 160 and travels along Nevada Highway 160 from Pahrump into Las Vegas. The race turns north from Blue Diamond Road onto Fort Apache Road to Desert Inn Road, then eastbound to Paradise Road before heading north to the finish line at the Westgate Las Vegas Resort Casino at 3000 Paradise Road in Las Vegas. Each team will be escorted by a pilot car. Motorists should anticipate lane restrictions and possible travel delays along the race route. Drivers are urged to use caution while traveling alongside the special event, to heed special event signage, and seek alternate detour routes when possible.